X Games gold medalist Maddie Bowman reaches for a grab during a run at the 2015 X Games. Tickets to Pyeongchang for the 2018 Winter Olympics have been punched for Team USA’s, freestyle, freeski, and snowboard teams. U.S. Ski & Snowboard announced the team members earlier in the week, and several athletes with local ties will be headed to South Korea for next month’s games. The reigning freestyle skiing halfpipe Olympic champions, Maddie Bowman, of South Lake Tahoe, and David Wise, of Reno, Nev., will return to the Olympics to defend their gold medals. Both skiers qualified for the games back on Jan. 12 after competing at the U.S. Grand Prix in Aspen-Snowmass. South Lake Tahoe resident Kyle Smaine, 26, put his name into contention to make the team after winning the final men’s halfpipe competition at the U.S. Snowboard & Freeski Grand Prix at Mammoth Mountain Ski Resort on Friday Jan. 19. Unfortunately, Smaine, who has the fifth most points for an American in the International Ski Federation (FIS) World Cup standings, was not among the four skiers chosen to represent the US next month. Also in freestyle skiing halfpipe, Brita Sigourney, 28, will return to the Olympics to for the second time, and claimed her spot on the team after topping Bowman in halfpipe to win the Olympic qualifier in Mammoth on Friday, Jan. 19. Sigourney, who is from Carmel, Calif., grew up skiing Alpine Meadows, and competed in skiing’s inaugural Olympic halfpipe event at the 2014 games in Sochi, Russia. She reached the finals and finished sixth. Sigourney is also three-time X Games medalist and first woman to land a 1080 in halfpipe competition. Local riders will look to bring home hardware next month after the U.S. Ski & Snowboard announced the Olympic snowboard team on Tuesday, Jan. 23. South Lake Tahoe’s Jamie Anderson, 27, will return to defend her 2014 Olympic gold medal in snowboard slopestyle. Anderson qualified for the games back in December after finishing second during the Dew Tour’s stop in Breckenridge, Colo.
After claiming the inaugural snowboard slopestyle gold medal, Anderson will have a chance to win the first big air gold medal when the event debuts at the 2018 Olympics. Joining Anderson will be first-timer Hailey Langland, 17, of San Clemente, Calif., who is a member of the Tahoe Snowboard Ski Team (formerly Tahoe Select). Langland has had a monster season, winning big air at the 2017 X Games in Aspen, Colo. She earned her way onto the team with a third-place finish at Mammoth on Saturday, Jan. 20. In women’s halfpipe, Chloe Kim, 17, of Torrance, Calif., qualified over a month ago for the games and will compete in her first Olympics. Kim, a member of Mammoth Mountain Snowboard Team, qualified to compete in the 2014 games, but she was too young to compete. Kim, who has Korean lineage and is a three-time X Games gold medalist, will be among the favorites to claim gold in Pyeongchang. 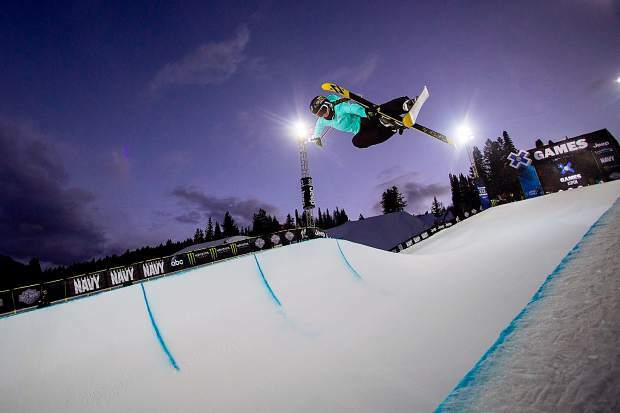 Also joining Kim, is fellow Mammoth Snowboard Team member, Maddie Mastro, 17, of Wrightwood, Calif. Mastro claimed her spot on the team after the final halfpipe competition in Mammoth. Also competing on the team are former gold medalists Shaun White, Kelly Clark, and Lindsey Jacobellis. “I would say qualifying for the Olympics is almost harder than competing at the Olympics. Especially when trying to make the U.S. Team, all our riders are so strong,” said White in a statement. Opening ceremonies for the Winter Olympics will take place on Friday, Feb. 9. Before the games many of the qualifying athletes will participate in the 2018 Inter Games in Buttermilk, Colo., from Jan. 25-28.